I’ve hired many people … and fired only a few. My best co-workers thrived because of three key character qualities. The disappointing ones struggled because they lacked the very same qualities. I’ve noticed an identical dynamic in friendships, marriages and ministries, all of which either thrived or withered to the degree that people cultivated humility, teachability and flexibility. Humility is the quality of having a modest view of one’s own importance, rank or abilities. It includes a recognition that you don’t have all the answers, that you may be wrong at times and that others may have better insights, wisdom and abilities in certain areas than you do (see Prov. 15:33; Prov. 18:12; Prov. 22:4; Phil. 2:3-4). Teachability is the quality of being able, willing and eager to learn from others. It includes an appreciation for the gifts, abilities and experiences of others and a recognition that you can benefit and grow by listening to and learning from them (see Prov. 13:1; Prov. 15:22; Prov. 15:31; Prov. 19:20). Flexibilty is the quality of being able to easily modify your own opinions, goals and actions. It includes the ability to adapt to new information, change course, compromise on non-moral issues, and value other’s interests as highly as your own (see Prov. 22:3; 1 Sam. 25:32-35; Phil. 2:3-4; Matt. 21:32; Luke 22:42). These three qualities are mutually supporting. The more you exercise any one of them, the easier and more natural it becomes to exercise the others. What does it look like when people are not humble, teachable and flexible? They are blind to their limitations and puffed up about their abilities. They love to draw attention to themselves. They don’t take notes, ask questions, read books with differing views or enjoy learning from others. They resent and resist advice and correction. They quickly point out flaws or failures of others. They refuse to admit when they’re wrong. They blame others rather than taking responsibility for problems. They resist moving out of their comfort zone, personally, relationally and vocationally. They stubbornly hold to questionable opinions, goals and practices. As a result, their friendships are typically shallow and fragile, their marriages are unfulfilling and often fail, and they experience little growth or satisfaction in their careers. What does it look like when you are steadily cultivating humility, teachability and flexibility? You are aware of and honest about both your strengths and limitations. You actually enjoy affirming and praising others. You take notes when others are speaking, ask questions that reveal your limitations, have a hunger for reading books that expose you to new perspectives, and truly enjoy learning from others. You are comfortable seeking advice and receive correction without becoming defensive. You charitably cover over others’ mistakes and failures. You’re quick to admit when you’re wrong or mistaken. You take responsibility for your contribution to a problem before addressing what others have done. You are willing to stretch yourself by exploring new ideas, accepting new responsibilities and developing new skills. You are able to change opinions, goals and practices as you acquire new information and grow in wisdom. As you continue to develop and practice these qualities, every relationship and activity in your life will benefit. Your friends will love sharing the ups and downs of their lives with you. Your marriage can become the safest and most enjoyable and secure relationship you could imagine. And your career can follow a steady upward course as you constantly learn from your co-workers and find joy in advancing their goals as much as your own. Humility … teachability … flexibility. Three qualities that can improve every relationship in your life. 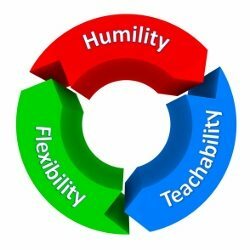 How do the qualities of humility, teachability and flexibility mutually reinforce and support one another? How do these three qualities contribute to better friendships? Why are these three qualities essential to a fulfilling and durable marriage? How do these three qualities contribute to better job performance and career advancement? 7 Responses to "Three Qualities that Improve Every Relationship"
Humility, Teachability and Flexibility. Good trio of attributes. Humility, Teachability, Flexibility are apparent in the people we like to be with. Humility is valued by others as the person who has humility is interested in a different viewpoint from their own and realize the best solutions are when you have input from different sources. People with teachability are interested in learning about many different topics and are by nature curious. Flexibility–not being rigid in your thoughts and actions reduces stress and these people are willing to adapt to new information that may change actions. People that you enjoy working with have all three of these traits–we need more of this! It is always very nice to come across people to that can accept and change when they have an opportunity and also the willingness to move forward in their careers and personal life. I believe that without having humility,teachability,an flexibility there’s no balance. humility is the same to me like being humble,being greatful for things, that goes into talking about teachability if your not a person that is willing to listen before talking it gives a person the enable to comprehend or to understand…being teachable is like having the means to understand an evaluate an situation whether big or small,which now plays into being able to being flexable having flexibility is being able to understand others an listen without judgement. Definitely see these attributes in a successful marriage. Surprisingly, if I think about it, flexibility is the one that many marriages lack. You are always “rolling with the punches” in a marriage.